It's easy to fill your days with PLAY at Smugglers' ... Good thing Summer days are long enough to fit in all the fun! Spending time together is easy here, because at Smugglers' your family comes first. Join us for afternoons filled with activities and exploration especially designed for families! Mountain bike with your daughter... Shoot hoops with your teenage son... Play ping-pong with your brother... Go hiking with your Mom... Play tennis with your Dad... Relax and play, share new experiences... whether it's for the day or your entire vacation. Each day is a blank canvas for your family — ready to be filled with new experiences and magical moments. Whether you're looking for information on the ecology of Smugglers' Notch, or just plain nature fun, the Nature Center is the place to visit. Most of the time it's a quiet reTREEt of intrigue, but it can "bee" a buzzing "hive" of activity when the Discovery or Trail Blazers children's camp groups are visiting. You'll find live animals and plants, hands-on displays, educational exhibits, and loads of nature games and books. Spend 5 minutes or spend 2 hours, adults and children alike will find plenty of interest and you'll learn a thing or two while you have fun! The Nature Center is located adjacent to the Discovery Center near the Mountainside Water Playground. Calling all rockhounds! Try your hand at panning for minerals and rocks with the Morse Mining Company adjacent to the Tennis and Family Fun Center. 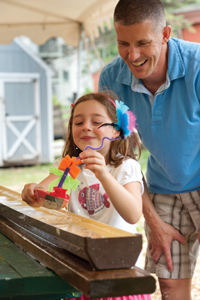 In this educational and fun mining operation, you'll shift and shake your panning tray as the water from our sluice box rinses away sediment and reveals nature's treasures. A pocket guide and identification station allow you to identify the northern Vermont minerals and rocks you've uncovered. Weather permitting. $6 plus tax for a 3 pound bag of rough, $8 plus tax for a 5 pound bag of rough. Journey around the Village following our clues, you might even learn something new. All ages. Meets at the star tent next to the Meeting House. Come work as a team to design and build model roller coasters! Loops, drops, and speed are all part of our plans! Explore what an engineer does and the importance of design and experimentation. Ages 4 & older. Meets at the Morse Highlands Day Lodge. Must be present at the start of the activity. Play as a family or in family teams. Simple games take on a new dimension when they become BIGGER! Check out Sticks & Stones, Giant Tic Tac Toe, Square Peg in a Round Hole, 5-n-2 Puzzle, or the Snappin' Alligator. Meet at the Adventure Tent on the Village Green. Learn all about physics as you design, build, and launch a model water rocket. How high will they go? It is up to your team to figure out a design that is best for flight! Ages 6 & older. Meets at the Morse Highlands Day Lodge. Must be present at the start of the activity. Join us for a game of GaGa ball, fun for the whole family. Ages 5 & older. Meets at the basketball courts. Join us in the Courtyard of the Village Center for your produce and delectable treats you will need for a great week ahead. Farmers and vendors will be on hand with fresh produce, cheese, wine, meat, maple syrup and desserts. Ahoy mateys - let the races begin! Create your own ship from materials provided by the Activities Crew. See who has the fastest seafarin' ship to sail down the raingutters. Other categories for ships to compete in are tallest, longest, widest, most seaworthy, most pirate-like, and cutest. Rockin' Ron the The Friendly Pirate will be on board for the fun. Meet at the Star Tent next to the Meeting House. Which shapes can you find in nature? Which shapes can you find in buildings at Smuggs? We will be finding and learning all about different shapes and their strengths. Then, we will build our own 2D and 3D shapes using marshmallows and toothpicks. Ages 4 & older. Meets at the Morse Highlands Day Lodge. Must be present at the start of the activity. Join the Big Air Dummy Derby using an assortment of supplies such as duct tape, balloons, paints, and cardboard - all supplemented by your imagination - to build your derby dummy. Will your dummy survive the ride off the Morse I-Did-A-Cart ramp, have the Most Inspiring Crash, or catch the Biggest Air? To find out... you have to try I-Did-A-Cart. Meet at the Adventure Tent on the Village Green. Watch out below! We will be dropping eggs from some pretty tall places. Will they make it? It is up to your team to design a package that will keep your egg safe. Ages 6 & older. Meets at the Morse Highlands Day Lodge. Must be present at the start of the activity. On the only non-river tour for the folks at Vermont Canoe and Kayak, they'll take you to explore a robotic dairy farm nestled in the beautiful hills of Fletcher, VT. The Sweet family will share with you their 100 year history of farming, educate and show how they have diversified to be sustainable in 2019. Enjoy interacting with Holstein & Jersey cows from baby calves to heifer stage to milking cows, and yes they are milked by robots! You may even spot their shaggy Scottish Highland herd grazing in the pasture. On this tour you will also enjoy white or chocolate milk and VT cheese as well as have the option to purchase their maple syrup. $50 per person ages 7 & up, $35 per child ages 3-6. Tour meets at Vermont Canoe & Kayak. Experience the thrill of soaring high into the sky with our outdoor Eurobungy. Combining the fun of a giant trampoline with bungee cords and a harness, means you can fly higher and do more tricks. Fly up to 20 feet in the air, flip around and bounce to your hearts content. Participants must weigh between 40 pounds - 200 pounds. $5 for a 5 minute session; Weather permitting, clothing and shoes required. Located at Notchville Park. Take a ride on our Giant Swing! For a high-flying family thrill, enjoy an exhilarating ride on our Giant Swing. This 100-foot swing is located at Notchville Park. Ages 8 & older. $5 per person per ride. Weather permitting, clothing and shoes required. Join our guide for an intro class on stand up paddleboarding. Guests must be able to swim ages 10 & older. Advance registration is required $15 per person. Meets at Bootleggers' Basin. Put your artistic skills to the test for our family Pictionary game. All ages. Meets at the Star tent behind the meeting house. Join us at Mountainside Pool for some water based fun. Games, contests and more. All ages. Meets at Mountainside Pool. Join our groovy staff for a 60's inspired tie dye blast. Swirl and style your own Smuggs t-shirt as a keepsake of your family vacation. $12 per person. Advance registration required. Space is limited. Meet at the Adventure Tent on the Village Green. Join us on the lower green for some water play. Soak each other with some water balloon battles or challenge your family with our new hydro blaster. All ages. Meets at Water Wars behind the Hearth & Candle. Rockin' Ron the Friendly Pirate presents pirate songs and lore for ALL ages. History, geography, nautical themes, and boatloads of wordplay. You RRR hereby invited to come aboard. Meet the crew at the Star Tent next to the Meeting House. Rain site is in the Meeting House. On the Village Green, teams of two race to the finish ... up for grabs, an automatic spot in the Country Fair FINALE race. No guts no glory! Ages 13 & older. Advance registration required at the Tennis & Family Fun Center. In case of inclement weather this activity will be cancelled. This event will be replaced with alternate activities on July 4. Explore the links between art and science with our STEAM approved projects for all ages. Meets at the STAR tent behind the Meeting House. Gather round our talented TREASURES staff while they read a wonderful story to the little ones. Ages 0-6. Meets at the star tent next to the Meeting House. Join us for a fast paced family fun race around the village of Smugglers' Notch Resort. Family teams navigate a race course consisting of several challenge stations before returning to complete the FunZone 2.0 Amazing Obstacle Course. There is no right or wrong way to complete the course - Families can choose their own path, collecting gold bullion along the way. Begin by developing your strategy to outwit and outmatch your opponents and then the race is on! Sneakers are suggested. Ages 5 & older. Pre-registration and notch card are required. Contact the Guest Service Desk at ext. 1293 or the Tennis Center at ext. 1173 to register. Come check out an amazing show of high flying discs and dogs brought to us by 802 Disc Dogs. All ages. Meets on the Village Green. Hike with your guides to a nearby ancient forest. Along the way you will learn about the natural habitat around you and what creatures might call this area home. Ages 7 & older. Meets at the star tent next to the Meeting House. Join us on the Village Green, alive with color for an old-fashioned evening of family fun. Goodtime Charlie host this magical evening of games, races, food and music. Our local artists will be showcasing their products. Participants from Sound & Stage Camp kick off the evening, followed by our very own Teen Jam Band performance. Rockin' Ron the Friendly Pirate, Mogul Mouse, Billy Bob Bear, Jammin' Sam will also be on hand! In case of inclement weather alternate programming will take place in the Meeting House and Bootleggers' Lounge. This event will be replaced by alternate activities on 7/4. Every wonder what it would be like to play in a life size Foosball game? Join us and experience it for yourself. Ages 7 & older. Meets at the Foosball Court located next to Morse Drive, across from Commons 1-6. Join our resident professor as he brings an exotic animal to visit for a unique learning experience. All ages. Meets at the star tent next to the Meeting House. Join us for some great art projects that your whole family will love. There is a lot of creative work to be done so please be prompt. All ages. Meets at the star tent next to the Meeting House. Challenge the whole family to some fun and exciting games of skill and chance, better get moving the clock starts NOW!!! Ages 7 & older. Meets at the star tent next to the Meeting House. Join us for a life sized game of the classic favorite, Hungry, Hungry Hippos. Meets in the Lower Level of the Meeting House.